"With all this power, those super-baddies out there don't stand a chance!" In addition to being a world-class athlete, Booster Gold has utilized a variety of advanced technologies, both offensive and defensive in nature, to assist his heroic endeavors. Though his technology and power levels have varied considerably over the years, each new incarnation of Booster's crime-fighting tools has emphasized a defensive force field, ranged energy rays, enhanced strength, and flight. Click on section headers to expand. Booster Gold is a human being from the 25th-century with well-developed physical prowess and leadership abilities. These natural abilities were honed while Booster played American football for Gotham University, earning accolades as the greatest quarterback of his time. His naturally superior speed and strength are enhanced drastically by the use of technology, most commonly in the form of a power suit of advanced design. Booster Gold possesses above average intelligence, though he often takes great pains to hide this fact as a defensive mechanism. On multiple occasions, Booster has demonstrated a rudimentary understanding of battlefield tactics and a keen awareness of the benefits of teamwork. Caring little for planning, Booster relies heavily on improvisational tactics and on-the-fly advice from Skeets or other battlefield companions. Among Booster's greatest strengths is his charismatic power to motivate others. Besides his intelligence, it is this ability of Booster's that is most often overlooked. Evidence of this often seen through his great salesmanship ability. Booster is often seen in the role of motivational cheerleader for his fellow members of the heroic community. Following the loss of his right arm and extensive damage to his heart and lungs, Booster received an undisclosed number and variety of unique prosthetic implants utilizing advanced S.T.A.R. Labs technology. Over time, these implants became painful, and Booster was the willing recipient of replacements offered by the villainous Monarch. While the exact nature of these implants remains unrevealed, they appear and function as normal limbs and organs do, providing no appreciable enhancement in arm strength or endurance. The fantastic and subversive nature of the implants as originally installed appear to have been rendered inert by Booster's own naturally advanced genetic make-up, which he inherited as a descendant of the Oan-evolved humans from the Millennium event. Only the combined abilities of Skeets and the Mark X Flesh Driver armor were able to manipulate Booster's prosthetic implants as offensive and defensive weapons. Among the items that Michael Jon Carter stole from the Space Museum of the 25th-century was a 30th-century Legion of Super Heroes Flight Ring. The ring, designed by Legionnaire Brainiac 5, harnesses an alien metal to provide its wielder with the power of flight. The ring is activated mentally via willful interaction and requires conscious thought to power flight. The ring is also capable of translating languages. Booster has demonstrated that the ring does not need to be worn to be manipulated mentally, but it must be in relatively close proximity to the user. Also stolen was a force field belt. This belt was also designed by Brainiac 5 (based on technology created by his ancestor, the original Brainiac). The advanced technology of the belt generates an extremely powerful personal force field capable of deflecting missile blasts or preventing oxygen-loss in the vacuum of space. The force field can be adapted and channeled to focus around the user or projected a moderate distance. Twentieth-century reproductions of Brainiac 5's force field created after the destruction of the original belt were considerably less resistant that the original "invulnerable" belt. 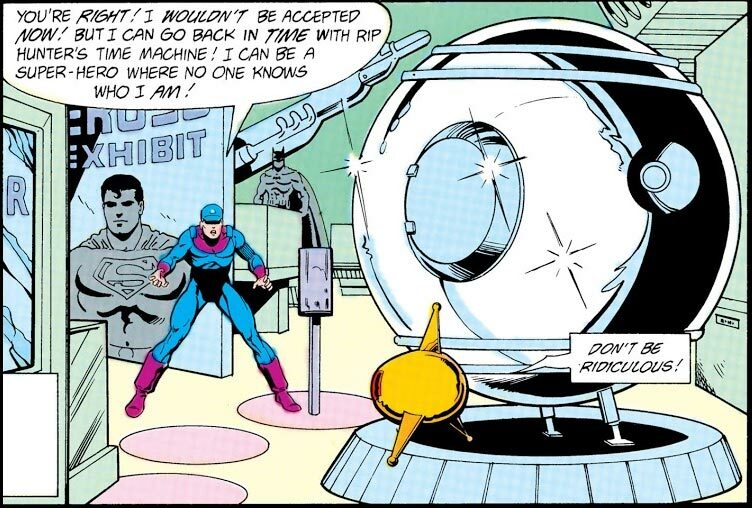 Oddly, the 30th-century technology of the Legion of Super-Heroes ended up in the 25th-century Space Museum by way of the 20th-century. When Brainiac 5 accompanied several Legionnaires into the past in order to apprehend Booster Gold for crimes against time (in Booster Gold #8, 1986 and Booster Gold #9, 1986), Brainiac donated the technology to Ronald Reagan, sitting President of the United States, in order to save him from an assassination attempt. The equipment would be passed forward, finally resting in the Space Museum where they would be stolen by Booster Gold. In addition to being a time paradox, this also means that Booster's reliable Flight Ring is over 500 years old. While most of Booster Gold's stolen 25th-century technology is definsive in nature, his alien-designed, wrist-mounted blaster rays are pure offense. Each wristband can fire a directed energy ray at the push of a lever concealed in Booster's gloves. The force of the blasts can be adjusted from a simple stun to a destructive blast able to destroy hardened concrete. Booster has nicknamed these weapons his "Booster Shots." Each version of Booster's armor has contained some form of arm or wrist mounted energy ray, always referred to by Booster as a Booster Shot despite variations in power output and origin. In most cases, Booster Shots exert the greatest strain on Booster's internal power supplies. While every power-suit worn by Booster Gold has included some form of eye-protection, few have been as versitile as his original power-suit's goggles. The goggles function as infrared (IR) sensors, allowing Booster to detect body heat and see at night. The goggles can also enhance vision, either enlarging things at a distance, like binoculars, or increase the apparent size of very small objects, like a microscope. Considering that it could allow someone to change history, nothing in Booster Gold's aresnal is as powerful or as dangerous as his Time Bubble. Invented by Time Master Rip Hunter, the Time Bubble is capable of traveling through spacetime to any point in history, past, present, or future. Booster original stole the Time Bubble from the Space Museum of the 25th century, but later was granted full access to the device by Rip Hunter himself when Booster agreed to help him defend the time stream from malicious crimes against history. Technology in Booster's power suit coupled with Skeets' internal computers allows remote access to the Time Bubble's time-travel capabilities. The least used power in all of Booster Gold's arsenal is the Mass Dispersion Field, originally called the "Mass Dispersal Force." The Mass Dispersion Field utilizes the Force Field (by "reversing polarity") to absorb large amounts of mass, either single or multiple objects weighing up to a combined several tons, and release and redirect that mass, either in its original state or in a new combination of the original items. In the rare occasions that Booster has used this power, it has generally been utilized to absorb and redirect projectiles. Generally used to enhance his strength to super human levels, a complete list of Booster Gold's power suits can be found here.